At a Vodou ceremony in Gonaives, women dance for the spirits—dances full of opposites, subtle and dynamic, graceful and ragged, the vibrant tones and rhythms of the drums creating calm, balance, sensuality, and passion. Les Stone watches these women shake, wail, and swoon, go into a trance, shout to the lwa, drop to the ground. He’s a critically acclaimed photographer, winner of several World Press Photo Awards and Picture of the Year Awards. Stone has chronicled the human cost of conflict in Iraq, Afghanistan, Israel, Sierra Leone, Kosovo, Liberia, Somalia, Cambodia, Vietnam, and many others. Stone has visited Haiti more than one hundred times. “Haiti is just an incredible, unique, Hemingwayesque sort of place,” he says. 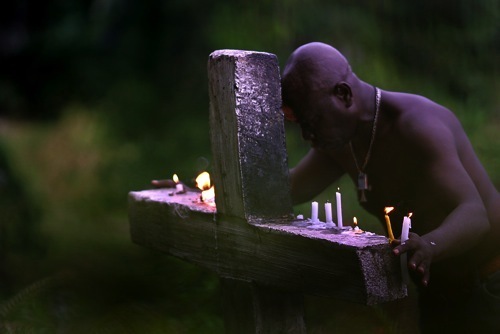 At Vodou Pilgrimage in the south of Haiti a man prays at Baron Samedi cross before entering sacred water fall and pool. Vodou was legalized in Haiti in 1987, under a new constitution that recognizes the rights of all religions. Stone’s work has appeared in the pages of National Geographic, Time, Life, Paris Match, Stern, Fortune, The New York Times, The New York Times Magazine, Newsweek, Mother Jones, and countless others.